I’ve been asked many times why I decided to become an engineer and my answer has always been I love math. As nerdy as it sounds, math is what triggered my interest in a technical field. I searched for math-oriented careers before college and choose civil engineering because of my interest in architecture and buildings. I focused on structural engineering in grad school, intending to work for an engineering-architecture firm out of school. However, due to the state of our economy, I quickly found that most companies weren’t looking to hire any new employees. I broadened my search and decided to begin my career with a job in roadway design. I will always be grateful for the opportunities I was given and the unique experiences I had at my first job, but I knew I still wanted to be a structural engineer. I left roadway design when I came across a position in bridge design. I knew it was a step in the right direction and having the opportunity to work on the St. Croix bridge in Stillwater, MN was exciting. Last fall, I accepted a new job (again) and finally took my career in the direction I’d always hoped to. Working as a structural engineer in building design has presented so many new and exciting opportunities. The biggest change for me has been working for a wider variety of clients and being involved in more aspects of the design process. For the first time in my career, I’ve been involved in the construction phase of projects. I love seeing things get built, so getting the opportunity to observe construction of a design I worked on has been awesome. After my adventure at Red Wing, my husband and I went for dinner at Pairings Food and Wine Market. It’s an upscale deli-style restaurant that offers salads, sandwiches, soups and some larger entrees, and pairs every meal option with great wine. It’s a fun place to try some new wines and learn about what foods to pair with them. I’d recommend checking it out next time you’re in the Minnetonka area. The soup of the day was Curried Carrot Bisque and I was so intrigued by it that I knew I needed to order it. As soon as I tried the first bite, I was hooked. 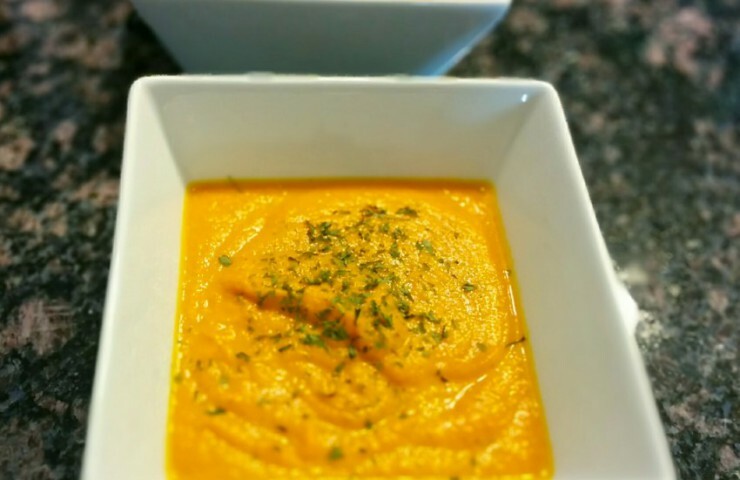 It resembled butternut squash soup because the consistency and vegetable flavor were similar, but the kick from the curry powder and standard bisque-like creaminess made it a unique concoction. I instantly started thinking about the ingredients and how I could re-create it home. I always have large amounts of carrots on hand for salads and juicing (yes, I’m the person who buys several 5 lb. bags at the grocery store), so I decided to roast a bunch and try coming up with a recipe! 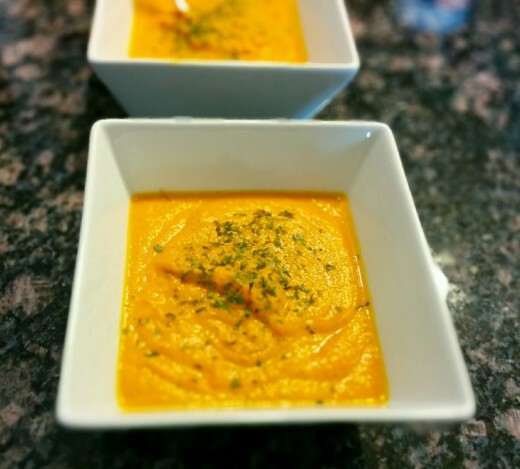 I learned a few things along the way that I’ll share with you as I explain the recipe. Overall, I thought it turned out great and I will definitely make this again. To begin, preheat the oven to 350°F and pull out your bag of carrots and prepare for some prep work. 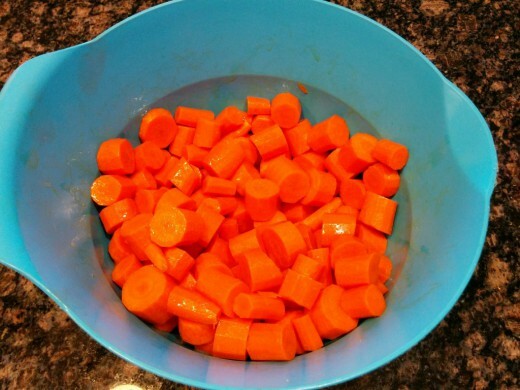 Wash, peel and dice up about 5 to 6 cups of carrots. Place them in a medium-sized mixing bowl, drizzle with a couple of tablespoons of olive oil and season with 1/2 teaspoon each of cumin, garlic powder, salt and pepper. 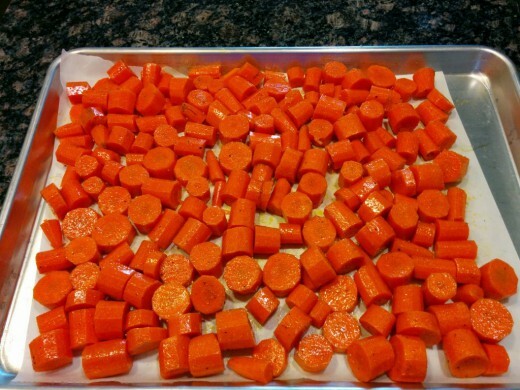 Line a baking sheet with parchment paper and transfer the carrots onto it. Bake for 60 to 75 minutes, until the carrots are soft and tender. 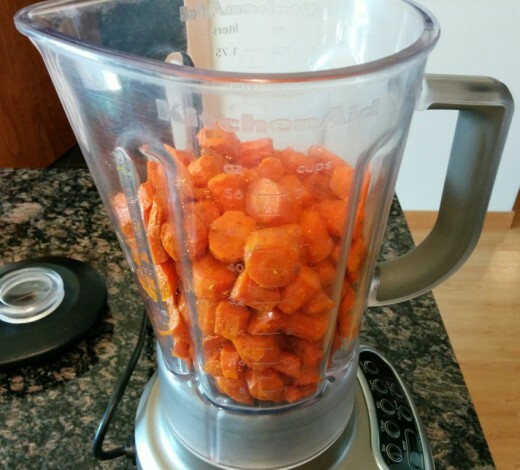 Transfer half of the carrots to a blender. I added all of them at once and by the time I added the liquid, the blender was too full. Add 2 1/2 cups chicken broth and 1/2 cup heavy cream. 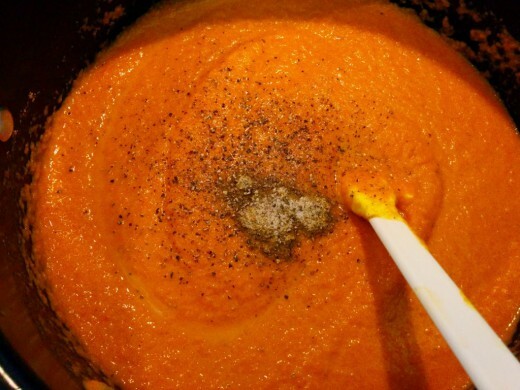 Blend on high until the carrots are pureed and the texture is smooth. 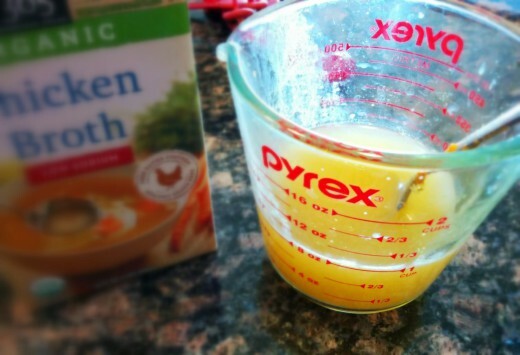 If the soup gets too thick while blending, add additional chicken broth, 1/4 cup at a time. Slowly pour the first batch of the soup into a pot and begin to heat over medium-low heat. 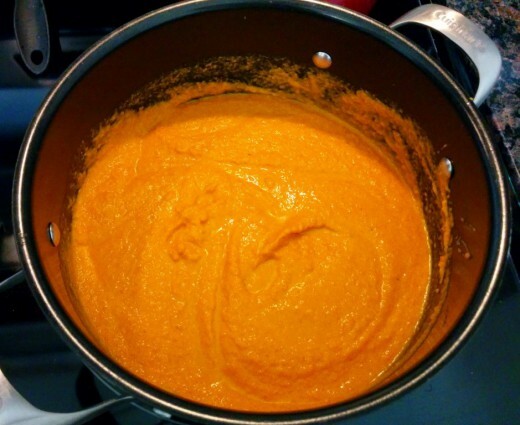 Then blend the second half of carrots with the remaining 2 1/2 cups of chicken broth and 1/2 cup heavy cream. Add the second pureed batch to the pot and continue to heat. 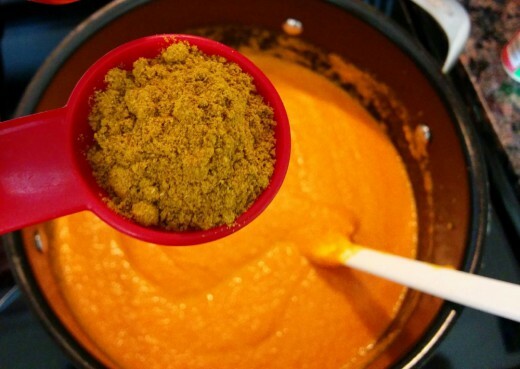 Stir in 1 tablespoon curry powder, 1/2 teaspoon salt, 1/2 teaspoon pepper and 1 teaspoon honey. I added almost double the amount of curry powder originally and it ended up being a little overpowering and spicy, so 1 tablespoon is plenty! 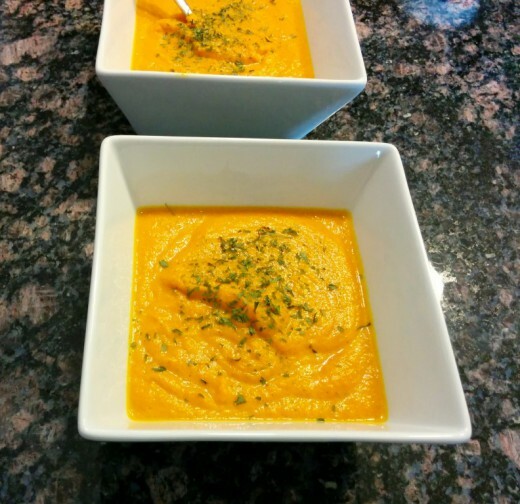 Heat until the soup is warm and enjoy immediately! 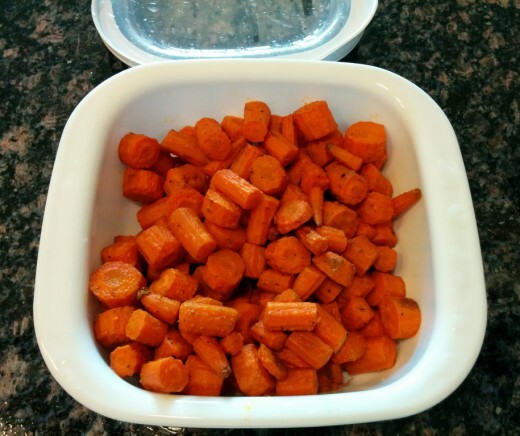 Place diced carrots into a medium-sized bowl and drizzle with olive oil. Season with salt and pepper. 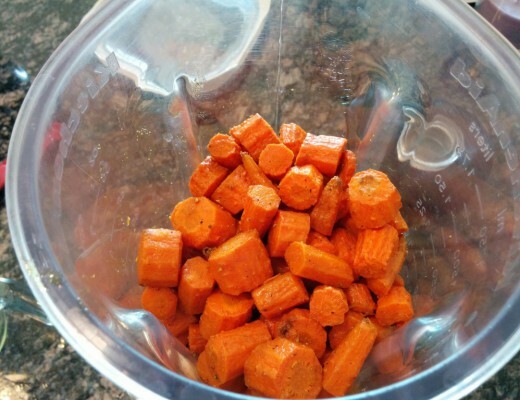 Transfer half of the carrots to the blender and pour in 2 1/2 cups chicken broth and 1/2 cup heavy cream. Blend on high until the texture is smooth. Pour into a large pot and begin to heat over medium-low heat. 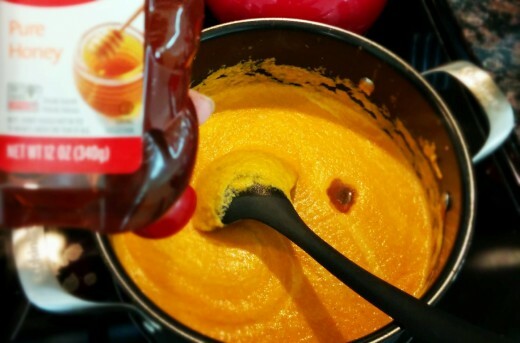 Add the second batch of carrots to the blender and puree with remaining 2 1/2 cups chicken broth and 1/2 cup heavy cream. Pour the second batch of pureed soup into the pot and continue to heat. Stir in curry powder, salt, pepper and honey. When the soup is heated through, enjoy!